I am a big proponent of breakfast. I love to pamper myself with large lavish breakfast, so whenever I travel my first criterion to choose a hotel is they have a good breakfast bar. My choice for breakfast always include bread and eggs and when they come together there nothing stopping me. 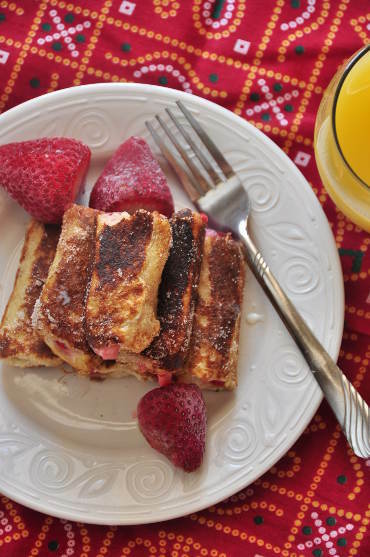 Be it the humble bread butter with a side of poached eggs or the Indian style spicy French toast – I love them all. 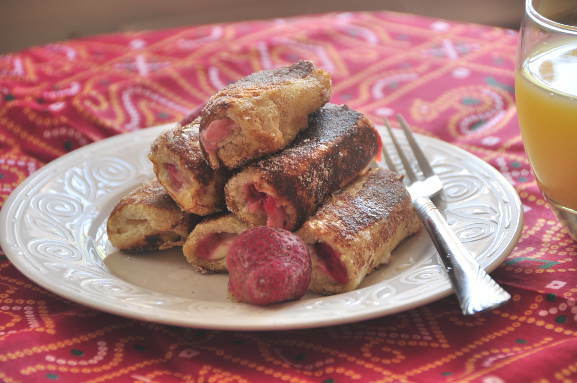 So, when I saw this photo on Pinterest for a French toast roll up, I just had to have it. I used cream cheese and strawberries for the filling, but to say the least, the options are unending. You can try it with cream cheese and chocolate chips, or nutella and raspberries or the American favorite peanut butter and jam. Try out these easy to make French roll ups and comment on what you used for the filling. Roll the bread, and dip in the beaten eggs and place the rolled up bread on the frying pan.